We’re on to day 3 of our two week cleanse. How’s everyone feeling? I know you may be trailing behind due to having to get groceries and prepare yourself mentally, but whatever day you’re on, even if you intend to start next week, we’re in it together. Over 100 of us have committed to this challenge. Awesome, right? Today is our first (and only) full day of liquids. I’m planning to take it easy today, meditate extra long, have a bath after yoga, and go to bed early. 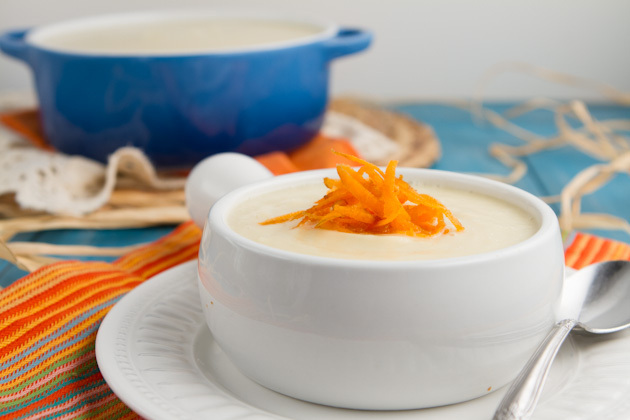 Oh yes, and enjoy a couple of bowls of this delicious soup. 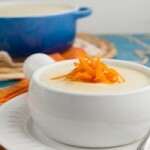 I am big into pureed soups. They’re fun to eat, easy to style in photos, and I find them to be more nourishing than chunky soups. That, and I can hide ingredients in them that Kevin doesn’t know about. For instance… this recipe? Doesn’t have cauliflower in it. Just milk, garlic and chicken. Kevin thinks that there’s chicken in this soup. And when I served it to him cold last night I poured at least a tablespoon of flax oil in his portion. He gobbled it all up and begged for more not even remotely knowing just how good it was for him! 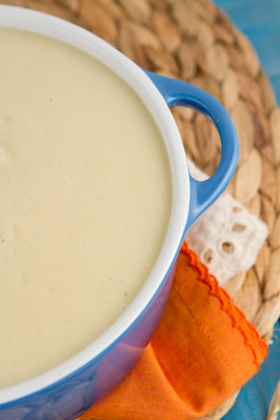 Roasted garlic soup made creamy with pureed cauliflower. 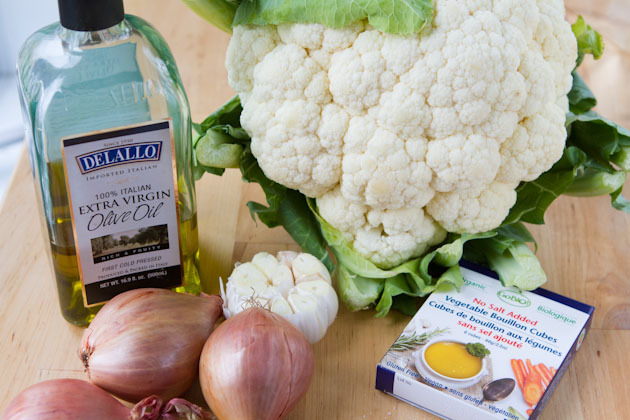 High in nutrients, simple to prepare, and scrumptious with each spoonful. Preheat oven to 400F. 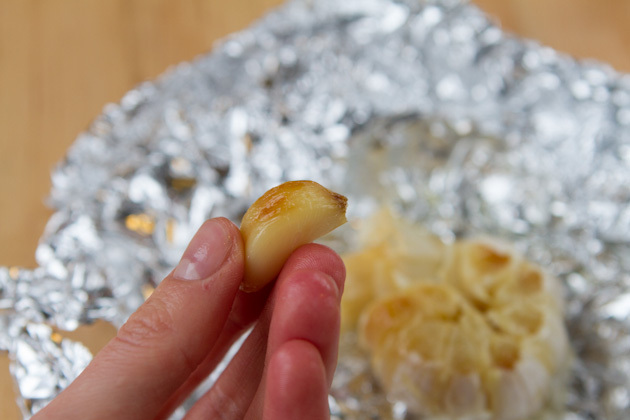 Peel the outer layers of the garlic bulb to reveal as much skin as possible while also keeping the individual cloves intact. Cut off about ¼-inch from the top of the bulb. Place in on a square of aluminum foil and coat each with ½ teaspoon of olive oil. Place in prepared oven for 35 minutes. Drop mixture into the bowl of your food processor or blender. Puree until smooth, about 30 seconds. Adjust with salt and pepper and serve. 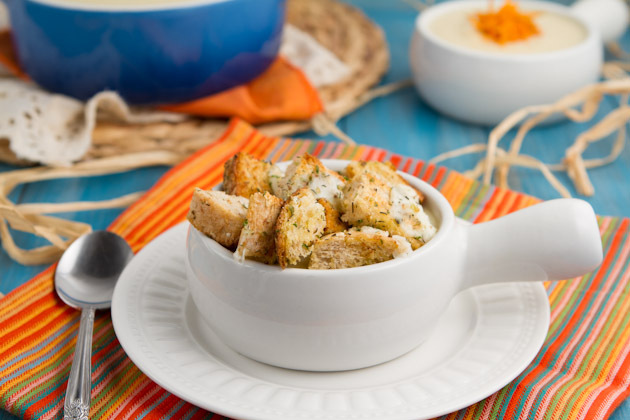 If you’re not on the cleanse with us and want to pump up this soup with a bit of extra pizzaz, head on over to my Happy Days Dairies Inspirations page for my recipe for goat cheese croutons. They’re crazy good and could be added to just about anything. Salads, soups, used as a dipper with hummus… rrr I mean… they’re not that great. Croutons? Gross. 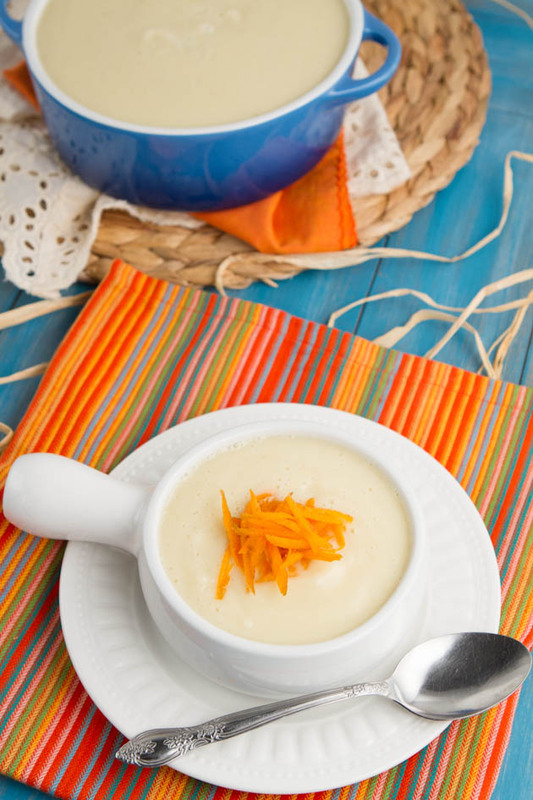 This soup is so easy to prepare. Really, it is. I’ve been making it for a couple of months and it’s my go to recipe when I’m too lazy to prepare an elaborate dinner for myself. If you don’t have time to roast the garlic, just throw a couple of minced cloves in with the shallots and be done with it. It will still taste just as good. Add the shallots, oil and garlic to a saucepan, saute, then add the rest of your ingredients. 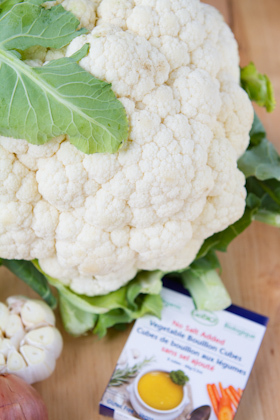 Stir to combine, cover and cook for 15-20 minutes until the cauliflower is nice and soft. I topped my portion with a large heap of shredded carrots and then proceeded to have two bowls of it. Just what the doctor ordered, I’ll tell you that much! 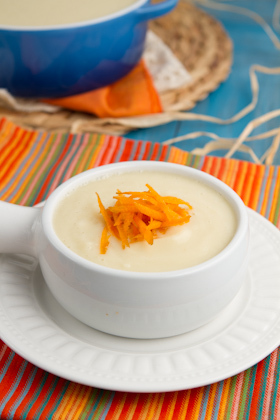 If you could choose your favorite soup of all time, what would it be?